Finding a high quality, inexpensive helmet is like finding the Holy Grail, and so this GM68S helmet by Gmax is appropriately named "Crusader." Here it is, folks: a fantastic, safe, full face helmet at a price for every rider. Gmax has included and improved upon the common features, like ventilation, and added a few of their own unique perks. 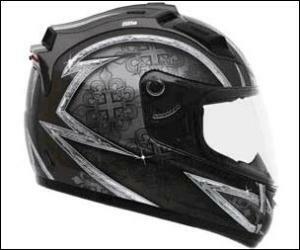 A high flow air system has 9 intake vents and 10 exhaust vents that are not blocked by the lining and provide some of the best ventilation in full face helmets. Large controls make it easy to adjust your ventilation without removing your gloves. The plush, washable liner gives the rider a comfortable fit with adjustable cheek pads. This is all within a DOT-approved thermoplastic poly-alloy shell. All manner of internal architectural engineering has made this a surprisingly quiet helmet that resists fogging. An anti-scratch, optically-correct shield covers the large eyeport, but being seen is almost as important as being able to see, so here is where one of Gmax's unique features comes in: LEDs. The Crusader has an LED light system with variable settings incorporated into the rear vents. Since you can't have eyes in the back of your head, having some lights there is the next best thing to avoid being rear-ended. Considering all the bells and whistles, this is a great-looking compact helmet. A high quality clear coat protects the water decals, and the patterning is comprised of a beautiful fleur-de-lis cross motif in a range of colors. If the Crusader is not your cup of tea, you can get the GM68S Dragon, Rebel, Max, Wizard, or Odyssey with name-appropriate patterns.